I recently purchased Easy VHS to DVD 3 Plus directly from Roxio. I installed the software on my Lenovo Windows 7 - 64 bit desktop computer. During the installation, I received a message saying that the process had been "interrupted" and that I should start over. I did that, and it installed completely. However, shortly after opening the program, I saw an on-screen message telling me that the software had installed unsigned drivers and that "Windows requires that all drivers be digitally signed." It told me to contact the manufacturer to obtain digitally signed drivers, but I was unable to find anything on the Roxio website. In the Device Manager list, there are two "Roxio Video Capture USB" entries; the first one has a yellow triangle. When I click on it, it says "Windows cannot verify the digital signature for the drivers required for this device. A recent hardware or software change might have installed a file that is signed incorrectly or damaged, or that might be malicious software from an unknown source. (Code 52)" I tried the "Update Driver", but the result was "Windows has determined the driver software for your device is up to date." I have the video capture device connected to my VHS machine with RCA cables (Red - White - Yellow), but the Roxio program is not receiving a signal. The Windows warning message is misleading... Windows does not "require". Plug in your device and Delete the entries in your Device Manager. (both) Then follow these steps to the letter. Make Sure you have unplugged your Roxio Capture Device and put it aside until you are completely finished. When the Repair competes, turn your AV & Firewall back on and reboot. Thanks so much for your reply, Jim. I followed the steps precisely. I deleted both Roxio entries from the device manager. I unplugged the capture device. I disabled my anti-virus and turned off the firewall. I put the Roxio disk in the drive, and chose "Repair." Once the process finished, I turned the firewall and AV back on and rebooted. I then plugged the capture device back in, and the Device Driver Software Installation began. Just as in the previous attempt, one installed correctly, the other failed. One other bit of information: last night, I decided to install it on my wife's computer. She has essentially the same machine, operating system, anti-virus, etc. as I do. The software installed perfectly, and I was able to easily transfer a video of my kids in elementary school to my PC, then burn it to a DVD --- no problems whatsoever. However, I bought this for my computer and would like to be able to use it there. JKL, did you reboot the computer after you uninstalled the drivers and removed the capture device. It is not real clear from Jim's post that that should be done to remove the bad drivers for the USB device.. Thanks guys! I did suspect that a reboot was called for, but I wanted to be diligent in following the instructions, so I didn't do it. However, I just repeated the procedure, WITH the reboot after removing the drivers, and again, the same result: "Failed." I've installed hundreds of programs and many devices over the years and never encountered anything like this! Let's do two things this time... I will give you an enhanced series of uninstall/reinstall steps to follow. Thanks Jim. I won't be home until tomorrow evening; I'll try it then. I downloaded Revo and completely uninstalled Roxio as you instructed. I rebooted, reinstalled Roxio and plugged in the capture device; once again, driver installation failed. 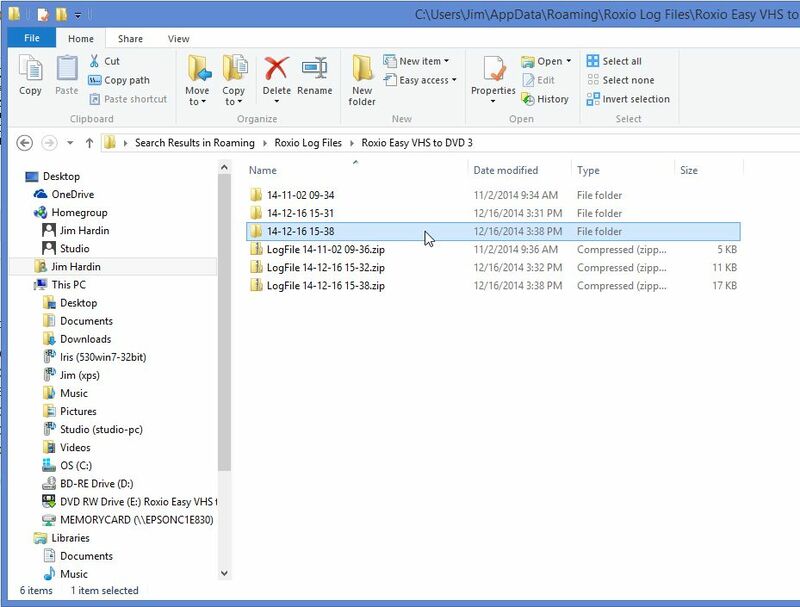 Which log file should I attach? One other thing: as many times as I have re-installed Roxio (about a million! ), I have never been asked to check for updates. I tried attaching the ROXIO_SETUP.LOG file and got the message: "You aren't permitted to upload this kind of file." No need to apologize; I really appreciate your help! I've attached it here. Yours should look just like that! Also no other yellow exclamation marks in the Device Manager. 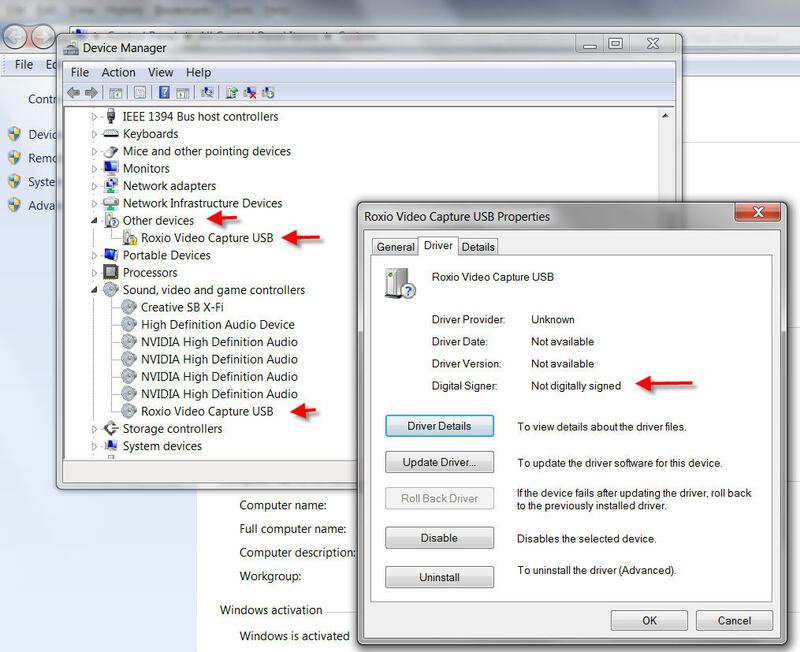 Device Manager shows the same exact result as every previous attempt: One "Roxio Video Capture USB" is fine, the other has a yellow exclamation point. When I open the one with the exclamation point, under the General tab, it says "Windows cannot verify the digital signature for the drivers required for this device. A recent hardware or software change might have installed a file that is signed incorrectly or damaged, or that might be malicious software from an unknown source. (Code 52)" When I try "Update Driver", it says "Windows has determined the driver software for your device is up to date." Before doing that again, create a New Administrator Account on your PC and do those actions under that Account. If Jim's advice doesn't work post your operating system and is it a x86 or x64 bit OS? I don't see your log file showing a error code 52 Windows cannot verify the digital signature for the drivers required for this device! It could be a corrupt Roxio file, a corrupt Windows file, or malware playing the games. Same results, unfortunately, when installed with a new admin login. Since I installed it successfully on my wife's computer from the same disk, I don't think it could be a problem with the Roxio file. My Lenovo Win 7 is 64 bit. Would it help to look at the VIDEOCAP_USB_30_X64_Install.log file? Also, I ran the "Microsoft® Windows® Malicious Software Removal Tool (KB890830) x64" and it found no malware. I just downloaded the drivers from Roxio (thanks for the link!). What do I need to know before proceeding (it comes as an .exe file)? We want to disable UAC! Windows 7 makes it much easier to deal with UAC settings, and in fact you don’t have to completely disable UAC if you don’t want to. Just type UAC into the start menu or Control Panel search box. Go to start run and paste the command GPEdit.msc and press OK.
Or type run in the search box and it is the top entry. You need to double click code signing for device drivers entry and the code signing for device drivers box opens. What is yours set at, Not Configured, Enabled, or Disabled? Thanks cdanteek. Sadly, I tried to run GPEdit.msc and got the message "Windows cannot find GPEdit.msc. Make sure you typed the name correctly and try again." I googled it and found that Win7 Home Premium does not include GPEdit. WHen I searched my computer for "User Configuration," all I got was Parental Controls. Sorry you said W-7 x64 and I assumed something I shouldn't have, sorry. Microsoft has included the Policy Editor only in the Enterprise and Ultimate versions of Windows 7. UAC is now disabled and the Roxio USB Drivers are uninstalled from device manager and the PC is rebooted? This will disable your Windows 7 driver signing. Shut down all running programs and now run \EasyVHStoDVDv3DriverX64_setup.exe, when done reboot the PC. 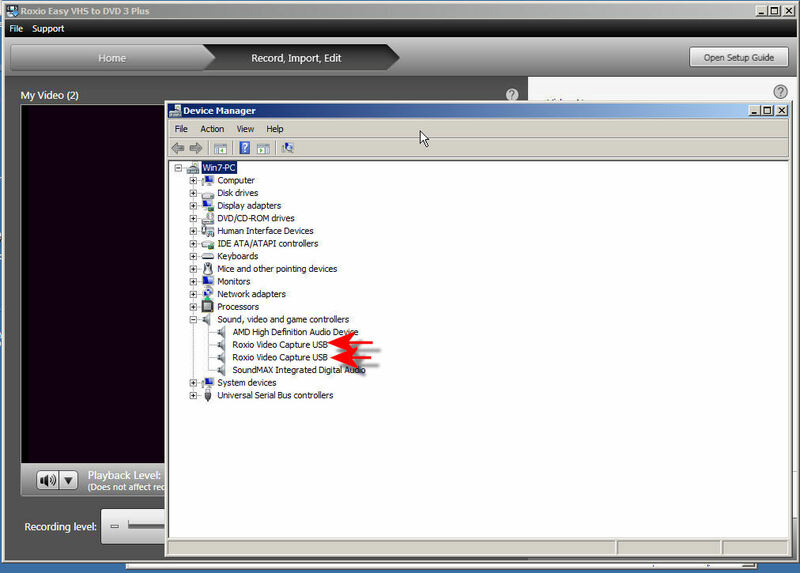 After it is up and running plugin the USB device and check device manager for the Roxio USB Drivers. To find a driver for this device, click Update Driver.". When I click Update Driver it says "Windows could not find driver software for your device". Windows shouldn't of installed a driver because you did install the correct driver if you followed the steps I outlined? Yes, I did all the steps, including running the EasyVHStoDVDv3DriverX64_setup.exe ; it ran the InstallShield Wizard, and when it was finished, it said "The InstallShield Wizard has successfully installed Roxio VHS Capture Driver. Click FInish to exit the wizard. I then rebooted and was surprised when I plugged in the device and the Windows Device Driver install began. I have broke these drivers every way one can, I can fix them using the methods explained above, and at it always fixes them!